2Box Drumit 5 Review - Is There Substance Behind That Color? 2Box Drumit 5 Review – Is There Substance Behind That Color? Whether you are a seasoned electronic drum kit player or an acousic kit player who wants an electronic kit for studio or practice use, you may be on the market for a digital kit. If that describes you, then you have likely already taken a look at some of the usual contenders by brands such as Roland. You may, however, have seen the 2Box Drumit 5 and may be wondering about it. This kit is unique in a few notable ways, and you might be wondering to yourself – How does it sound? Is it worth the price? What’s with that loud orange color? This 2Box Drumit 5 review is meant to answer those questions for you. For with this kit, 2Box has thrown their hat into the ring with some heavy hitters, and they have tried to make a splash by offering a truly singular electronic kit, something that stands out from the crowd. The question is: have they succeeded? 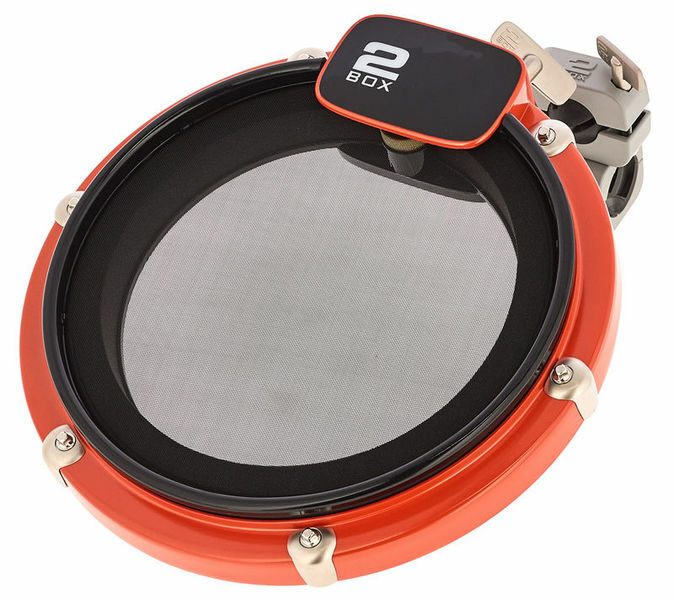 Update: the 2Box Drumit 5 is no longer availble in the US – not even on eBay. For alternative options check out my favorite e-drum kits here. 3 Toms – This kit comes along with 2 rack mounted Toms and one “Floor” Tom mounted on the side by the drum module. 1 Snare – One of the interesting things about this kit is that the snare is mounted on its own stand, independent from the rest of the kit. This makes it, to me, feel more like an acoustic kit. Software – This is one of the highlights of this kit. More on the software later. The Drumit 5 module is easy to use and high quality. It produces some truly great natural drum sounds and comes stocked with a variety of highly usable presets. The sounds this module is capable of producing are lacking in the synthesized, digital, electronic kit department when compared to the straightforwardly wacky sounds that some other comparable kits can produce, but I don’t know if this is a problem for me. Highly digital drum sounds define an area that drum machines have by now all but made their own. Finally, there is the software. This is one of the things that sets this kit apart from virtually all others. The software included with purchase goes beyond subtle customization and allows the player full sonic control. Given the sonic strengths of this kit’s module – and it’s proclivity toward great acoustic sounds – you will likely not want or be able to use this software to create wild, synthetic sounds. But if you are interested in having a limitless supply of great, fully custom acoustic sounds, then this software will appeal to you. One of the strengths of this kit, to me, is its pads. The heads themselves are thin mesh – not unlike some Roland heads. Yet, through the multi-layered construction and the screws, the 2Box Drumit 5 heads can be made to feel like almost anything, including your acoustic kit. To me, this is a real strength. There is something great about electronic kit heads when they are done well (and these heads are), especially if you are trying to play quietly at home – but for some of us there is simply no replacing the feel of our acoustic kits. Now, you can have both! Roland is a great name, and we musicians are vain. We love our Fender guitars and our Roland electronic kits. 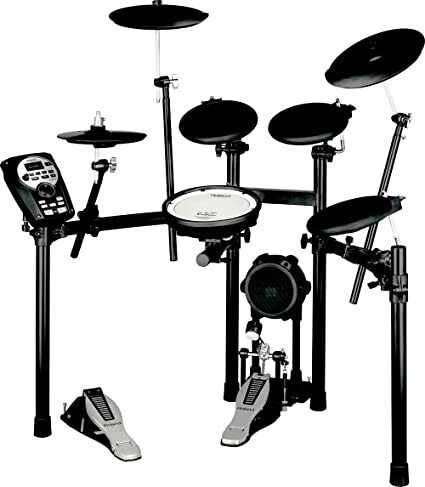 For that reason, it can be hard to look past an electronic kit such as the Roland TD-11K. The TD-11K is a fantastic kit, and even though it is not inexpensive, it can be had for less than the Drumit 5. So how does the Drumit 5 stack up? but the Drumit is more customizable and perhaps closer to an acoustic kit in both sound and feel. In that sense, the choice between them is one of preference, and it may come down to the price tag for you. 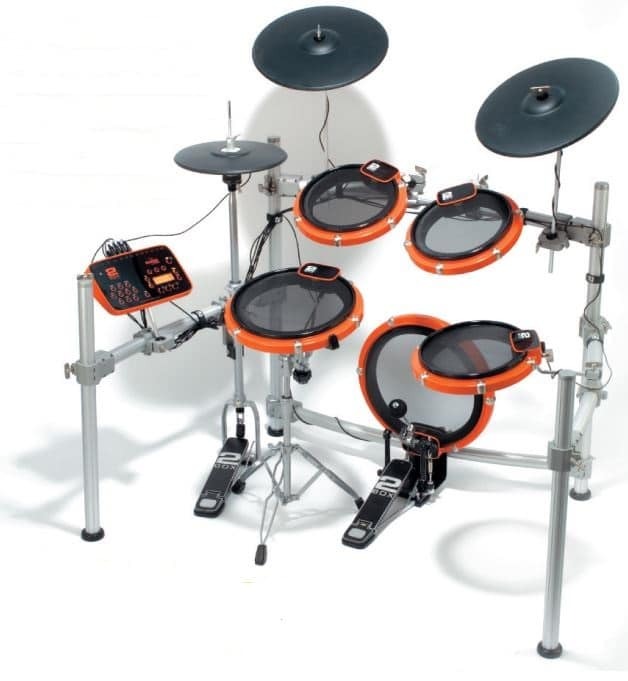 But for my money, there is something about the Drumit that points toward what I hope is an emerging trend in electronic kits – real attention paid to the reproduction of acoustic kits. When I use an electronic kit, I love that it is lightweight, and easy to move and store. I also love that I have a large number of sounds at my disposal. And both points are true for the 2Box Drumit 5 as well as the Roland TD-11K. But in the end, the 2Box Drumit 5 felt a little more like an acoustic kit to me – and I liked that very much! Update: nothing but the module is still being sold in the US and I’m currently looking to test one of the newer 2Box drum kits. In the meantime, check out my best alternatives. Perhaps this kit is less digital than most electronic kits. Less digital in the sense of being more analog sounding, more acoustic oriented (both in sound and in feel). And for me, this is a good thing. For I think highly synthetic sounds are the province of drum machines and handheld pads. We program them in our DAWs and tap them out on our tablets. But there is so much to be said for live drumming – for the presence of a real life drummer with sticks in their hands. This 2Box kit is all about that sound and that experience, and it comes highly recommended. The bottom line is this – I would buy this kit in an instant if I was looking for a great electronic kit that reproduces acoustic sounds and feels well and that gives me great control over the sounds I have at my disposal. Let me know what you’re thinking about this kit so far. Any questions? Criticism of what I said? Or do you own this kit yourself? Drop me a comment and I’ll get back to you within 2 days at the latest! What do you think of using the 2box module with the td11kw? The qauality is not that good actually. Cymbals break all the time. If using td11 with a vst like ezdrummer, could it be as good as the 2box in feel and sound? Using the TD-11KV with the 2Box Drumit would be different in terms of the hardware of course. Everything else (sound range, sound quality etc.) would stay as it is with the 2Box Drumit 5 module.